​Do you know what you are truly hungry for? What is your ravenous hunger or disdain for eating trying to tell you? Did you know that there is a profound message that your disordered eating is trying to speak to you? But, what if this language it speaks is coded? Would you want to decode the message it has for you? Are you ready to break free from being stuck in this cycle? To answer these questions and decode the language of your out-of-order relationship with food and your body, join us at the Soul Hunger Workshop with Dr. Anita Johnston, PhD. Anita is an internationally renowned story-teller, speaker, and the author of the life-changing, enlightening book: Eating in the Light of the Moon: How Women Can Transform their Relationship with Food and their Bodies through Myth, Metaphor and Storytelling. Through her passionate, energetic story-telling of myths and metaphors from around the world, Anita explores the archetypal energies of the woman’s soul while guiding us on a spiritual journey to learn how these energies relate to us personally. 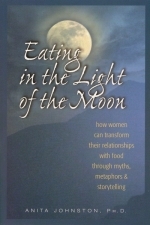 Anita teaches that women struggling with food, eating and body image issues are actually experiencing a deeper longing inside, one to which the world’s vast history of Sacred Feminine myths and metaphors holds the key. In a culture where issues around eating and body image are the norm among women, it is refreshing and enlightening to understand these challenges from a different perspective, and to realize that these issues are not beyond your control. Do you find yourself perpetually craving sweets? Where is that sweetness absent in your life? Why do we gorge ourselves on food? Is there something we are trying to push down or keep from feeling? These are only two of the many ways to see eating and food cravings as metaphors and relate to them so we can find clarity and freedom. Through shifting our perspectives, and using the myths and stories of the past as guideposts, we can learn to understand ourselves more clearly, and recognize how our cravings and hungers can give us valuable insights into what it is we desire in life. In this way we, as empowered women, can understand what we truly hunger for and move to fulfill our true craving instead. It is by tapping into the timeless Sacred Feminine energy flowing through each of us, the energy of gentle compassion, clear intuition, and true power, that we discover and learn to utilize our own strength to heal and grow as women. ​And for dessert? Nothing in life is sweeter than nourishing your Soul. You will leave the Soul Hunger Workshop with a deeper connection to yourself and greater insights into your own patterns and behaviors. You will also gain the knowledge necessary to make permanent, positive changes in your life and be spiritually supported throughout your empowerment journey. It is our most sincere wish that you will take this day to discover your true self, open your heart, tap into the Sacred Feminine Energy inside you, and taste all the glorious sweetness that this life has to offer! ​You can Register by clicking here now to guarantee your spot! ​Or copy and paste the following link into your browser to sign up. ​RSVP here to get a reminder and pay later.